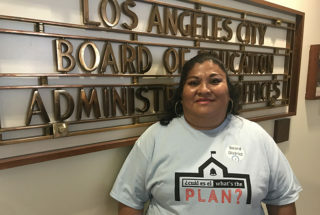 Vicenta Martinez, whose daughter attends Union Avenue Elementary in Los Angeles’s Westlake neighborhood, was part of a group of Parent Revolution parents who addressed the school board last Tuesday asking “What’s the plan?” for underperforming schools. There’s been a lot of talk but little action from Los Angeles and California education officials when it comes to supporting the lowest-performing schools. Last week state board members again voted to put off revisions to California’s education plan, which are required in order for the plan to be approved by the federal Department of Education under the Every Student Succeeds Act. In January, California’s plan to improve its schools received some of the toughest criticism in the nation from the Department of Education, which came as no surprise to parents and education advocates. In postponing the revisions last week, some board members said they might sooner apply for waivers than compromise. EdVoice is part of a coalition of seven advocacy organizations that called this month for the state Board of Education to make crucial fixes to California’s plan to comply with ESSA, which requires that states identify the lowest-performing 5 percent of schools in order to get them targeted support. The LA Unified school board held a special meeting last month to discuss how to support its lowest-performing schools. Nearly every board meeting includes emotional pleas from parents who want to see the board talk less and do more. LA Unified doesn’t keep an official list of its lowest-performers, though board members say everyone knows which ones they are. A district spokeswoman said LA Unified will wait until the state comes up with its list, but it’s not clear when or even if the state will do that. The state also hasn’t listed its lowest-performing schools, only the 228 lowest-performing districts. “They’ve done some data runs, but they’ve never published the names of those schools,” said Carrie Hahnel, deputy director of research and policy for The Education Trust — West, one of the seven advocacy organizations in the coalition. “I think that’s fair,” she said, since the state won’t be required to identify the schools until next year and will do so off next year’s data. But that doesn’t mean school districts can’t be doing that themselves. “Even if not required to by federal law, that’s really what should be happening,” Hahnel said. “I think it would be helpful for districts to tell people which schools they think need support. There’s enough in place with the dashboard to make some decisions on it,” she said, referencing the California School Dashboard, the state’s new accountability system that evaluates schools based on student progress on test scores, suspension and graduation rates, English learners’ progress toward fluency, and high school students’ college and career readiness. New data released this month by Parent Revolution show that 234 LA Unified schools fell in the bottom two levels — orange or red — for both English and math on the dashboard. Last year there were 155,779 students enrolled in those 234 schools. LA Unified has 34 schools that are red in both English and math. Last year they enrolled 26,400 students. Five percent of LA Unified’s enrollment of about 590,000 is roughly 30,000 students. The group also posted maps of where the schools with the lowest math and English test scores are located in Los Angeles, along with charts broken down by school board district. It also released a report with guidance for the state to be able to translate the state dashboard data into an overall quality rating for each school. The report was created with Teach Plus California and the Center for American Progress. A list of underperforming schools in Los Angeles that need the most targeted support could be generated by LA Unified’s revised Student Equity Need Index, which is being presented at Tuesday’s Committee of the Whole meeting. School board members will hear a presentation on what’s being called the 2.0 version of the index, which was first created in 2014 to help direct state funds to the district’s neediest schools. The goal is to rank schools to show which should be prioritized for additional funding, and for the first time academic indicators will be used in that ranking. Board members in recent meetings have also offered various ideas on how to help LA’s low-performing schools. They include creating a separate school district for them, closing or combining some of them, or creating smaller learning communities within a school. Other ideas are setting up a system of evaluating district schools in a similar way independent charter schools are assessed by the district, or changing the whole curriculum for low-performing schools so that every subject, such as social studies and art, includes a math and English component. Esmeralda Fabián Romero contributed to this report.